You can watch Sky Go abroad (outside the UK) in the USA, Spain or anywhere else if you use a suitable VPN. Using a VPN to connect to Sky Go is simple, however not all VPNs will work. We'll show you how to watch Sky Go abroad and which VPNs still work. Sky Go is free to existing customers with cable or satellite subscriptions that include Sky channels. Sky does not offer a standalone internet-only subscription or pay-per-view content, so cord cutters will have to look elsewhere. ExpressVPN: Best option for watching Sky Go abroad. Blazingly fast servers provide a high-quality streaming experience. Top notch security, keep no logs and includes a 30-day money-back guarantee. NordVPN: A good budget option that works well with Sky Go abroad along with other streaming services, including Netflix. IPVanish: Good security paired with fast speeds. No logs. PrivateVPN: Small provider with a few servers in the UK and Ireland that can access Sky Go from anywhere. VyprVPN: Owns its own data centers and offers good streaming with high security. No torrenting. Luckily, if you are in Europe, the US or any other country outside of the UK and Ireland and want to access Sky Go, you can still access the service with a VPN. Short for Virtual Private Network, a VPN encrypts all of a device’s internet traffic and routes it through an intermediary server in a location of your choosing. 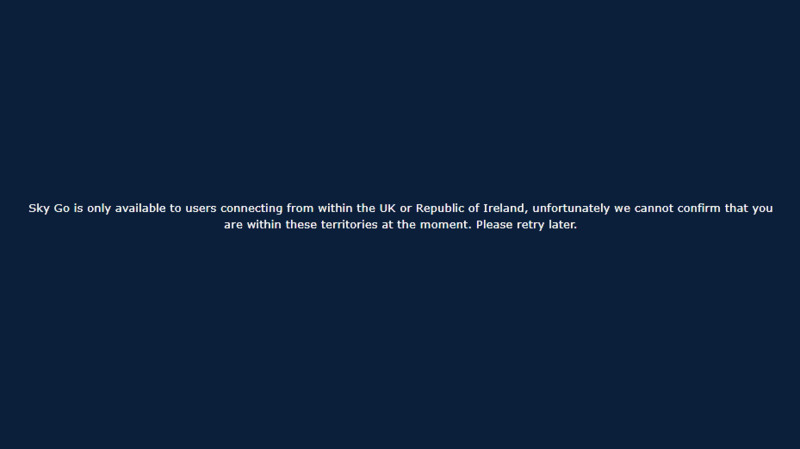 By connecting to such a server in the UK, you will be assigned a UK IP address and be able to access geo-locked content in the country, including Sky Go. First, sign up for one of the VPNs listed below. We particularly recommend ExpressVPN. Download and install the VPN software on your device or configure your router to use the VPN. Run the VPN, choose a server in the UK, and connect. Clear your cookies and refresh the page with the video you want to watch. Below is our list of the best VPNs for Sky Go. All of these VPN providers meet most, if not all, of the above criteria. ExpressVPN tops our list as the best VPN for Sky Go. It optimizes all of its servers for maximum speed and stability, offering subscribers unlimited bandwidth and data. It operates servers in several locations in the UK, and connecting is quick and easy thanks to its well-designed apps. Encryption standards are as strong as you’ll find on any VPN, namely 256-bit AES encryption (often dubbed military-grade encryption) and perfect forward secrecy. The company doesn’t log any of its customers activity nor their IP addresses, opting only to gather non-identifying metadata. Live customer support is available through the websites 24 hours per day, seven days per week. Apps are available for Windows, MacOS, iOS, Android, and Linux (command line). If you watch Sky Go on a device that doesn’t support VPNs, you can opt to either use ExpressVPN’s DNS proxy service MediaStreamer, which is included with every subscription. You can also install ExpressVPN’s customer router firmware on comptabile wifi routers, or purchase a pre-configured router directly from the company. This will route internet traffic of any devices connected to your wifi router through the VPN server, which is ideal for game consoles and smart TVs. ExpressVPN can also unblock US and UK Netflix, Hulu, HBO Now, and BBC iPlayer, among many others. BEST VPN FOR SKY GO:ExpressVPN is our #1 Choice. Reliably unblocks Sky Go as well as many other streaming services. Exceptional speeds for buffer-free HD viewing along with total security and privacy. Try it risk-free with the 30-day money back guarantee. 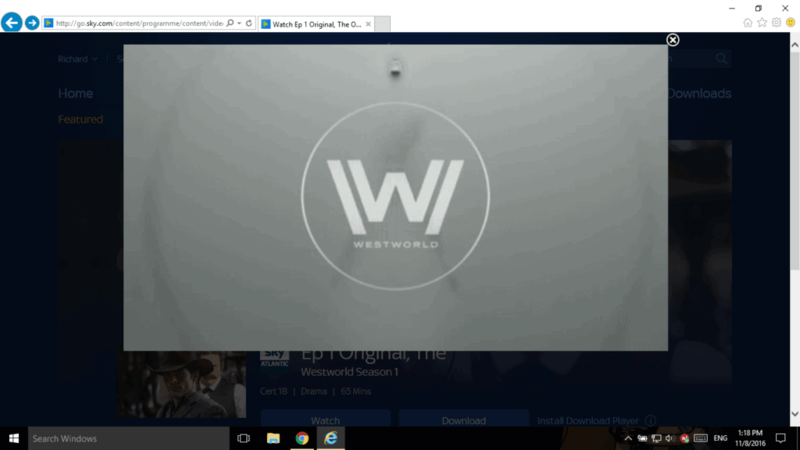 NordVPN is another excellent choice for a Sky Go VPN. It is a master of unblocking streaming services, and Sky Go is no different. Just connect to one of the dozens of UK servers available in its network and you can start streaming Sky Go right away. Speeds are adequate and connections rarely drop, so streaming your favorite shows in HD won’t be a problem. This VPN service is backed by a true zero logs policy and uncrackable encryption. Live chat support is available on the website. Automatic wi-fi protection will ensure you’re always secure while using public wi-fi networks. VPN software is available for Windows, MacOS, iOS, and Android. Pre-configured routers can be purchased through Flashrouters if you use a device that doesn’t support VPNs natively. A single NordVPN subscription allows subscribers to connect up to six devices at the same time, making NordVPN a great value. NordVPN also unblocks Netflix content in several countries including the US and UK, Hulu, HBO Now, and BBC iPlayer, among others. BEST BUDGET VPN:NordVPN is great on value. A great value option which works well with Sky Go. Allows up to 6 simultaneous connected devices. Great privacy and security credentials. 30-day money back guarantee. IPVanish operates a huge network of servers in over 60 countries, the UK being just one of them. Subscribers can take advantage of unlimited bandwidth and no data caps to stream to their heart’s delight. The company owns, rather than rents, its servers, ensuring a high-quality stream with minimal buffering. Top-notch encryption standards are combined with a no logs policy to keep your ISP and other snoopers out of your hair. An internet kill switch, DNS leak protection, and an obfuscation (scramble) feature are all built into the app. Apps are available for Windows, MacOS, iOS, and Android. If your device isn’t VPN-compatible, consider purchasing a router pre-configured with all of IPV’s servers from Flashrouters. This VPN service is also a favorite among Kodi users thanks to an easy to install and use app and the ability to work with any Kodi add-on. LARGE SERVER NETWORK:IPVanish works with up to 10 connected devices. Fast connections, lightweight easy to use apps, good multi-platform support. Reliable with Sky Go but can’t unblock as many other streaming services as some of its rivals. 7-day money-back guarantee. PrivateVPN is the new kid on the block, but it’s making a big splash despite its small size. Although it only has just over 100 servers in its network compared to the 1,000+ of others on this list, speeds are excellent and the service has no problem unblocking Sky Go. PrivateVPN doesn’t skimp on the security side of things either, utilizing powerful encryption and adhering to a no logs policy. The apps come with DNS leak protection and a kill switch. Apps are available for Windows, MacOS, iOS, and Android. You can connect up to five devices at the same time. PrivateVPN also unblocks Netflix in several countries including the US and UK, plus a handful of other streaming services like BBC iPlayer and HBO Now. GREAT SPEEDS:PrivateVPN is a good family choice. Unblocks Sky Go and allows up to 6 devices on the same account. Small network of servers but fast connections. 30-day money back guarantee. VyprVPN is a veteran of the VPN space and remains a top choice for users around the world, including those looking for a Sky Go VPN. The company owns and operates its own servers and even entire data centers in dozens of countries, including the UK. This VPN service offers excellent speeds and you should have no problem streaming live and on-demand video from Sky Go. The company does log users’ real IP addresses, but no details of your online activity are recorded. Apps are available for Windows, MacOS, iOS, and Android. Pre-flashed routers that come configured with all of VyprVPN’s servers are available for sale as well–useful if you prefer to stream Sky Go through a game console, smart TV, or set-top box. VyprVPN can also unblock Hulu and US Netflix. EASY TO USE:VyprVPN is user friendly. Works well with Sky Go and most popular streaming services. Easy to install and get going but a bit pricey. 30-day money-back guarantee. We’ve discussed some quality paid options for Sky Go VPN providers, but there are also a ton of free VPNs available. These seem like attractive choices but we recommend steering clear as these services are typically plagued with issues. A free VPN provider will often have too many users and a limited number of servers. This results in long wait times for servers and slow, unreliable connections. And that’s not the worst part. Many of these services use shady business tactics to make money. They might track user activity and sell customer profiles to advertisers and have even been known to steal users’ idle bandwidth. It’s definitely worth a few dollars a month to know you’re being served and protected by a reputable VPN provider. How do VPNs unblock Sky Go? A VPN, or virtual private network, is a tool that encrypts all of a device’s internet traffic and routes it through an intermediary server in a location of the user’s choosing. In this case, you would connect to a server in the UK. This changes the user’s IP address to that of the VPN server and thus makes it look to Sky Go as if you are accessing the service from inside the UK. This is a perfectly legal and very popular means of accessing Sky Go abroad. Plus, the fact that a Sky Go VPN encrypts your traffic ensures your data is always secure, even while using public wi-fi. You need a browser that supports Microsoft Silverlight, which means Internet Explorer (not Edge) for Windows users and Safari for Mac users. Firefox and Chrome have both ended support for Silverlight. If you tried accessing a video and were blocked prior to using a VPN or DNS proxy, it’s probably a good idea to clear your browser cookies and cache before making another attempt. A smart DNS proxy accomplishes the same result as a VPN in regards to Sky Go, but it works a bit differently. Instead of encrypting all of a device’s traffic and routing it through a remote server, only the DNS requests are redirected. DNS, or domain name system, is like a phone book for the internet. But instead of matching phone numbers with people, DNS matches web domains (like “www.comparitech.com”) with IP addresses. Every time you access a different website, you first send a DNS request to find the matching IP. By changing the location of where these DNS requests are sent to–the UK, in this instance–you can make it appear as though you are accessing Sky Go from within the country. Setting up DNS servers is a bit trickier than setting up a VPN, but you usually don’t need to install any extra software. DNS settings can be adjusted using your device’s built-in settings. Sign up with a smart DNS proxy provider, our recommendation is Overplay. Validate your device’s current IP address on the provider’s website. Navigate to the Sky Go webpage or open the Sky Go app and enjoy! Sky Go is an online television service from UK broadcaster Sky that was first launched in 2006. It was previously known as Sky Player, Sky Anytime PC, and Sky By Broadband. The service allows subscribers to watch live and on-demand video on multiple internet connected devices including Windows PC, Mac OSX, iOS, Android, and game consoles. That includes some HBO original content like Westworld and Last Week Tonight and a wide range of sport including live English Premier League soccer, cricket, golf and Formula 1 to name a few. Sky cable subscriptions start at 20 GBP per month with a minimum 1-year contract. Subscribers can watch videos on up to two simultaneous devices by default, and up to four are available for an extra fee as part of the Sky Go Extra package. If you have used two devices in the past and want to use a third, you must remove an existing registered device before you can register another. Sky Go Extra also allows users to download content to their local devices so they can watch offline. The content is DRM protected, which means it can’t be copied, distributed, or watched after the expiration date. Files are deleted 48 hours after viewing starts or no later than 30 days after download. 14 How do VPNs unblock Sky Go? 9 How do VPNs unblock Sky Go?